When looking to specify timber for construction, it is imperative to thoroughly investigate specific designs, site conditions, the National Building Regulations as well as timber quality, to ensure a successful project. 1. Timber-framed structures built in accordance with SANS 10082 – Code of Practice for Timber Buildings. This Code of Practice outlines the deemed-to-satisfy requirements for the design and construction of timber-framed structures. 2. Timber roof trusses manufactured in accordance with Part L Roofs of SANS 10400, “The application of the National Building Regulations”. This standard outlines the deemed-to-satisfy requirements for nailed and bolted trusses, and specifies timber sizes along with the number of nails and bolts as well as the accepted truss shape. 3. Engaging the services of a professional engineer (as required in Part B of the National Building Regulations), who would work in strict accordance with SANS 10160, “Loading code”, and SANS 10163, “The structural use of timber”. Timber-framed structures in compliance with SANS 10082 are deemed to satisfy the National Building Regulations and to be in compliance with SANS 10400, which covers conventional construction methods and processes. Only deviations from the specified design and construction requirements of SANS 10082 will demand engineering intervention and the provision of a rational design. Approval has, in general, been given by municipalities to prefabricated truss fabricators who use a suite of rational design programmes supplied by system suppliers to design roofs up to 10m in span for non-public buildings. All of these system suppliers have been accredited and approved by the ITC-SA. All larger buildings and those to which the public has access, are to be designed under the supervision of professional engineers applying rational design criteria to satisfy engineering-first principals. Engineers who have access to engineering design software can use these design programmes to satisfy the rational design requirements. Timber structures designed by a competent person in accordance with Part B of the National Building Regulations are not limited to the size, height, span, pitch and geometric configuration of structures as specified in SANS 10082 or Part L of SANS 10400. The ITC-SA works closely with the Technical Committees of the South African Bureau of Standards (SABS) on grading and treatment specifications for structural timber, including design codes and standards for structural timber, as well as on matters affecting the National Building Regulations and their application. The ITC-SA has also instituted a Certificate of Competence scheme for timber frame builders and truss fabricators (truss plants) who design, manufacture and supply prefabricated nail-plated trusses. Stringent auditing of both the professions’ operations and key personnel is done before the awarding of such Certificates of Competence. This is an assurance of quality on timber structures for both the specifier and general public. In certain magisterial districts in South Africa, it is illegal to use timber which has not been treated against biological attack for structural purposes. Treatment can be completed using either CCA or Boron in accordance with SANS 10005, “Treatment of timber”. All timber used in a structural application should be structural South African pine that complies with the requirements of SANS 1783-2/1460/10149 and bears the full standardisation mark. Timber used for roof battens should comply with SANS 1783-4 and should also bear the full standardisation mark. 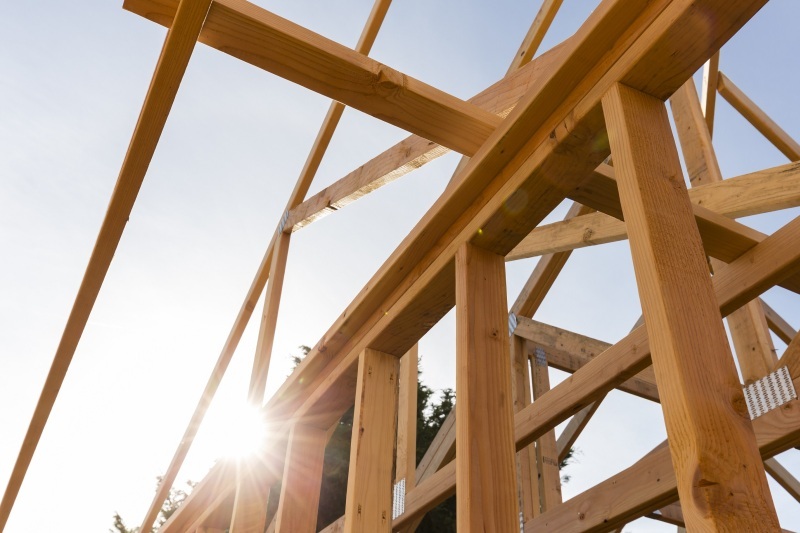 Timber used for the construction of timber structures on site must be ordered in the dimensions in which it will be used and should not be re-sawn into smaller cross-sectional sizes on site, as this will cause the grade, strength and dimensional tolerances to change. Structural timber stored on site should be stacked on level ground on bearers and should be adequately protected against the weather by being covered with a waterproof material. Air must be allowed to circulate through the timber stacks and strapping around bundles of battens should not be removed until the battens are to be fixed, to prevent excessive warping. • Overall span of roof. • Cantilever distance (if any). • Truss spacing (can be optimised by the truss engineer) normally 760mm for concrete tiles and 1 100mm for sheeting. • Roofing materials plus any special loads such as solar panels. • Ceiling materials plus any special loads such as air-conditioning. • Geyser position and capacity. • Hatch openings, size and position. • Other details which may affect the design. For further information or to find an ITC-SA accredited fabricator, visit www.itc-sa.org. When specifying for timber construction, it is imperative to make a thorough study of elements, such as specific designs, site conditions, the National Building Regulations as well as timber quality, to ensure a successful project.